Coming nearly a year after the release of ‘The One Doctor,’ Big Finish reunites writers Gareth Roberts and Clayton Hickman to provide another tale rooted in comedy. 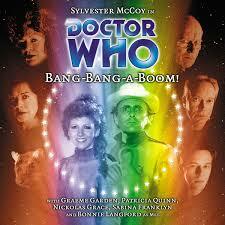 Whereas that previous release focused on the tendencies of Doctor Who itself, however, ‘Bang-Bang-A-Boom!’ takes aim at more grandiose science fiction programmes such as Star Trek while including more than passing references to the Eurovision contest and some of the worst aspects of Sylvester McCoy and Bonnie Langford’s televised series together. The plot of the tale essentially boils down to a murder mystery aboard Dark Space 8 during the Intergalactic Song Contest. As suspicion falls on a surprising amount of characters, it allows for a rather thorough exploration of everyone’s mindset and motivations and allows the secret conference storyline to unfold naturally. The Doctor assembling the surviving characters at the end and casting suspicion on each of them before revealing the true suspect is very characteristic of the shows this release is parodying, but it’s an unexpected pleasure to have the closing theme suddenly stop as Mel realizes that the answers are all too easy, resulting in another crazed rush to stop the true villain. It really comes down to the parodying aspects that flesh out the release as more than just a murder mystery with a clever twist, though. Doctor Harcourt dictating her log at the beginning of the story and filling it with incessantly long-winded and overly-detailed exposition is the perfect encapsulation of Star Trek to many casual viewers or non-fans, and it works exceedingly well in setting the scene in a tongue-in-cheek manner. The endless technobabble and the Doctor suddenly becoming irresistible after assuming command are nice touches as well. The supporting cast is explored fairly well here, most amusingly Sabina Franklyn’s Doctor Harcourt as her continual cries of feeling helpless gain extra meaning as the eventual revelation that she doesn’t hold a degree means she has actually had a hand in the deaths of many people over the years. Anthony Spargo’s Nicky Newman is the perfect sendup of a typical pop star sensation, and it makes sense that he takes an interest in Mel as the one person who doesn’t instantly recognize him. His innate nervousness and the danger he presents after swallowing a device that will explode when he reaches a certain level of fear are nicely portrayed as well. Nickolas Grace is also superb as the irritable Loozly who holds so many secrets. Angvia as played by Patricia Quinn, though, is a bit of a wild card, some sure to love her and some sure to hate her. Her performance and accent are both purposefully over the top, and her determination to seduce the Doctor makes for some genuinely funny and sometimes uncomfortable moments. McCoy plays the Doctor as suitably uncomfortable here as well, adding to the scenes immensely. Both of the regulars are served well here, the Seventh Doctor’s more clownish and light-hearted aura from his time with Langford suiting the script expertly. Mel’s natural inquisitiveness may not lead her to solving the mystery of the murder, but it certainly affords her ample opportunity to showcase her strong comedic timing and to be a pair of eyes for the listeners. ‘Bang-Bang-A-Boom!’ may not be as strong as its predecessor ‘The One Doctor,’ and some of the initial charm starts to wear off through the course of four episodes, but the writers do a suitable job in keeping things fresh and interesting as events continue to unfold and the plot becomes more serious. Given its content, this is certainly a story that will not appeal to some, but it’s certainly another interesting take on Doctor Who and what its expansive format can accomplish. I love this one, largely cuz the writing is so on point With the humor and McCoy really delivers.